Also available: HTML-only, VRML and Chime-enhanced versions. Karen Wetterhahn was an internationally respected Professor of Chemistry, an expert researcher in the field of the effects of heavy metals upon living systems, especially in their role in causing cancer. By an exquisite irony, she became a victim of a heavy metal poison. The Albert Bradley Third Century Professor in the Sciences at Dartmouth College, New Hampshire, Wetterhahn was doing something few professors do - working at the lab bench - on August 14th 1996. She was studying the way mercury ions interacted with DNA repair proteins, and was using [Hg(CH3)2] as a standard reference material for 199Hg NMR measurements. Wetterhahn knew about the high toxicity of dimethylmercury and took very reasonable precautions, donning safety glasses and latex gloves, doing manipulations in a fume cupboard and only working with very small quantities behind the fume cupboard sash. Dimethylmercury, supplied by a chemical manufacturer, came in a sealed glass vial. A colleague of hers cooled the vial in ice-water to reduce the volatility of the Hg(CH3)2 then cut off the glass top to open it. Wetterhahn pipetted a small sample into a NMR tube and transferred the rest into a storage container, sealed and labeled the tubes and cleaned up, disposing of the latex gloves. Less than a year later, she was dead from the effects of mercury poisoning. Wetterhahn later recalled spilling a drop of dimethylmercury, possibly more, on her gloved hand. Test showed subsequently that this would have penetrated the glove and started entering her skin within 15 seconds. It is now accepted that the only safe precaution to take when handling this compound is to wear highly resistant laminated gloves underneath a pair of long-cuffed neoprene (or other heavy duty) gloves. In January 1997, she began to notice definite symptoms that worried her - tingly fingers and toes, slurred speech. She began to have problems with her balance and her field of vision started to shrink. Mercury poisoning was diagnosed on January 28th 1997. Tests revealed that she had a blood mercury level of 4000 micrograms per litre, 80 times the toxic threshold. Two weeks later she slipped into a coma from which she never recovered, dying on June 8th 1997. It is a liquid at room temperature, with a faint sweet smell (not a good career move). It has a boiling point of 92°C at atmospheric pressure and a density of 2.96 g/cm3. It has a linear structure, like many HgX2 systems with Hg-C = 2.083 Å. It is one of the most potent neurotoxins known. It readily crosses the blood-brain barrier, probably due to its formation of a methylmercury-cysteine complex. It causes ataxia (lack of coordination), sensory disturbance and changes in mental state. It inhibits several stages of neurotransmission in the brain. It is a cumulative poison, being very slowly removed (excreted) from the body, and by the time its effects are noted it is too late to do anything about it. Why is the formation of a cysteine complex important? Mercury is a "soft acid" so that it binds to easily polarisable donor atoms in "soft" bases. This gives the mercury ion a high affinity for sulphur and sulphur containing ligands. It will thus attack the thiol groups of enzymes and inhibit them. Zeise made the first mercaptan (R-SH) ligands and coined their name, based on the Latin expression mercurium captans, capturing mercury. 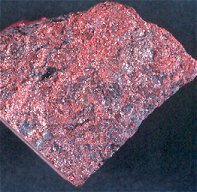 The main ore of mercury is cinnabar, HgS (shown, right). It has been mined for 2500 years in places like Almaden in Spain. Other important mines are at Idria in Slovenia and Monte Amiata in Italy. In Roman times, criminals sentenced to work in quicksilver mines had a short life expectancy because of the toxicity of the mercury in cinnabar. It was regarded as a death sentence, and Pliny described the symptoms of mercury poisoning in the first century AD. Cinnabar was widely used as a pigment in the ancient world and its colour is recognised today (from 1982 to 1987, the author of these notes drove a Mini whose colour was described as "cinnabar" by the manufacturers). Unfortunately, there have been lots. Once upon a time, people used mercury and its compounds to treat syphilis. Although not successful, it enjoyed a vogue for a considerable time until penicillin was found to be an effective cure for this disease in its earlier stages. One important use of mercury compounds was in hatmaking; 200 years ago, the furs used to make beaver felt hats was dipped into mercury(II) nitrate solution as a preservative and to soften the animal hairs. Unfortunately the workers in the felt hat trade absorbed mercury through their skins; the resulting mercury poisoning caused shaking and slurred speech, being known as "hatter's disease", which is believed to have inspired the character of the Mad Hatter in Lewis Carroll's Alice in Wonderland, a character made famous in Tenniel's drawing (below). Another source of poisoning was the (mis)use of alkyl mercury compounds used as fungicides on seeds. Between the World Wars, workers in fungicide manufacturing plants had developed mercury poisoning. In 1942 two young Canadian secretaries working in an office of a warehouse in Calgary, Canada, were fatally poisoned. The warehouse was storing diethyl mercury. In the 1960s, Swedish farmers noticed birds flopping helplessly on the ground then dying. Birds had been eating mercury-treated grain, or else rodents that had consumed it. More horrifying than this were epidemics of poisoning, caused by people eating treated seed grains. There was a serious epidemic in Iraq in 1956 and again in 1960, whilst use of seed wheat (which had been treated with a mixture of C2H5HgCl and C6H5HgOCOCH3) for food, caused the poisoning of about 100 people in West Pakistan in 1961. Another outbreak happened in Guatemala in 1965. Most serious was the disaster in Iraq in 1971-2, when according to official figures 459 died. Grain had been treated with methyl mercury compounds as a fungicide and should have been planted. Instead it was sold for milling and made into bread. It had been dyed red as a warning and also had warning labels in English and Spanish that no one could understand. But Minamata was an accident? That's debatable. Given what was known about the toxicity of mercury compounds at the time, people could have acted sooner, at the very least. In the early 1950s, inhabitants of the seaside town of Minamata, on Kyushu island in Japan, noticed strange behaviour in animals. Cats would exhibit nervous tremors, dance and scream. Within a few years this was observed in other animals; birds would drop out of the sky. Symptoms were also observed in fish, an important component of diet, especially for the poor. When human symptoms started to be noticed around 1956 an investigation began. Fishing was officially banned in 1957. It was found that the Chisso Corporation, a petrochemical company and maker of plastics such as vinyl chloride, had been discharging heavy metal waste into the sea. They used mercury compounds as catalysts in their syntheses. It is believed that over 1400 people were killed and perhaps 20000 have been poisoned to a lesser extent. Methylcobalamin, a coenzyme form of Vitamin B12, is capable of methylating "inorganic" mercury compounds to form CH3Hg+(aq), also by methylation of mercury itself. The actual mercury species present in solution may be CH3HgOH. The CH3Hg+(aq) ion is absorbed by plankton, which is in turn eaten by small fish. The fish eat so much of the contaminated plankton, and they excrete the mercury so slowly, that it gradually builds up in their systems. The small fish are then eaten by larger fish, and the concentration of mercury in the organism increases each time. Animals and humans eating these larger fish concentrate the mercury even more, so that the final concentration in animals higher up the food chain (such as humans) can be thousands or millions of times larger than was present in the original water. This process is known as "biomagnification" (see figure, right). So the world has learned from these tragedies? Regrettably not, if problems connected with the use of mercury in mining precious metals are anything to go by. Mercury forms mixtures with many metals, known as amalgams. It is used to extract metallic gold from gold ores on account of this, the gold being recovered by distilling off the mercury. Most miners do not recover the mercury, so that it finds its way into rivers, where it gets converted into the methylmercury ion, and this has been a problem in California as a legacy of the 1849 Gold rush. It was used to refine Mexican silver in the 16th century. The (mis)use of mercury in gold mining is currently an issue in the Amazon region of South America, West Africa and other places. Mercury is cheap and convenient to use, and that's all some people care. So chemistry is a dangerous subject? Doing chemistry is safe, much safer than driving a car. A chemistry laboratory is about the safest place in a school or university, far safer than the sports field. It is only by ceaseless vigilance and attention to safety that it remains so. W.E.Smith, and A.M.Smith, Minamata. New York: Holt, Rinehart and Winston, 1975. L.Friberg and J.Vostal, Mercury in the Environment, CRC Press, Cleveland, Ohio, 1972. National Research Council Committee on the Toxicological Effects of Methylmercury, Toxicological effects of Methylmercury, National Academy Press, Washington, 2000. C.U.Eccles and Z.Aman, eds., The Toxicity of Methylmercury, The John Hopkins University Press, Baltimore, 1987. R.J.Gillespie and I Hargittai, The VSEPR Model of Molecular Geometry, Allyn and Bacon, Boston, 1991, p. 166. Dictionary of Organometallic Compounds, J.E.Macintyre ed., Chapman and Hall, London, 2nd edition, 1995, Compound Hg-00076. R.J.Lewis, Sax's Dangerous Properties of Industrial Materials, 8th edition, Van Nostrand-Reinhold, 1992, DSM 450. C. Reto, J. Rural Remote Environmental Health, 2002, 1, 10.